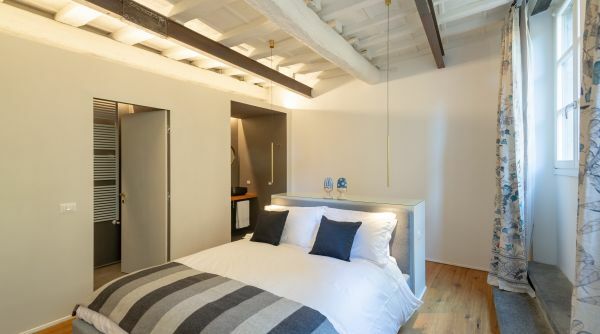 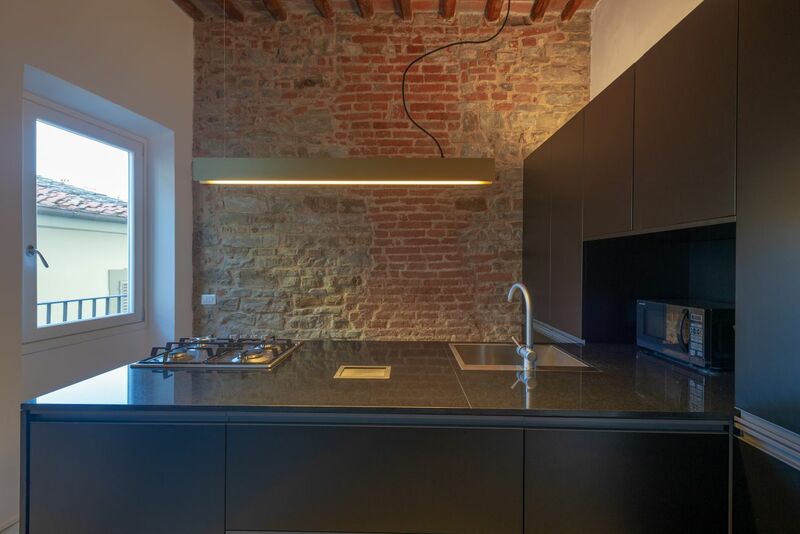 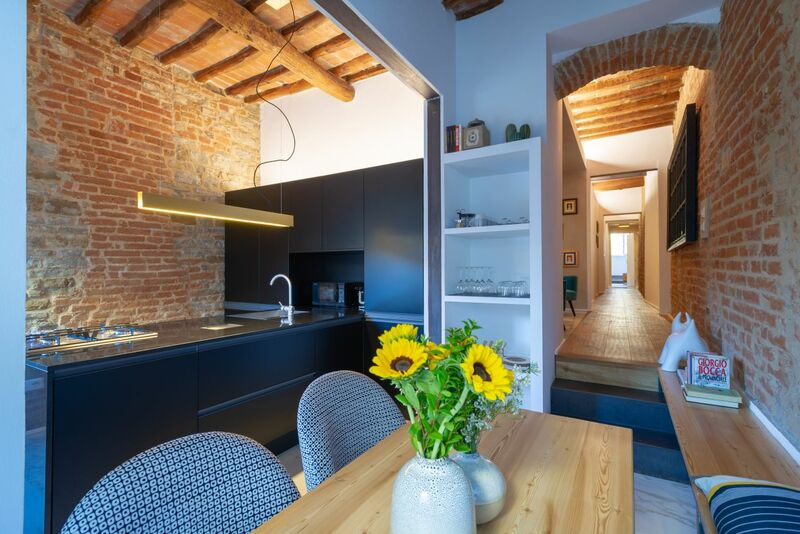 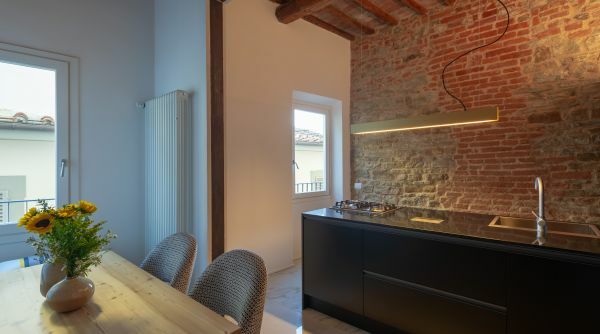 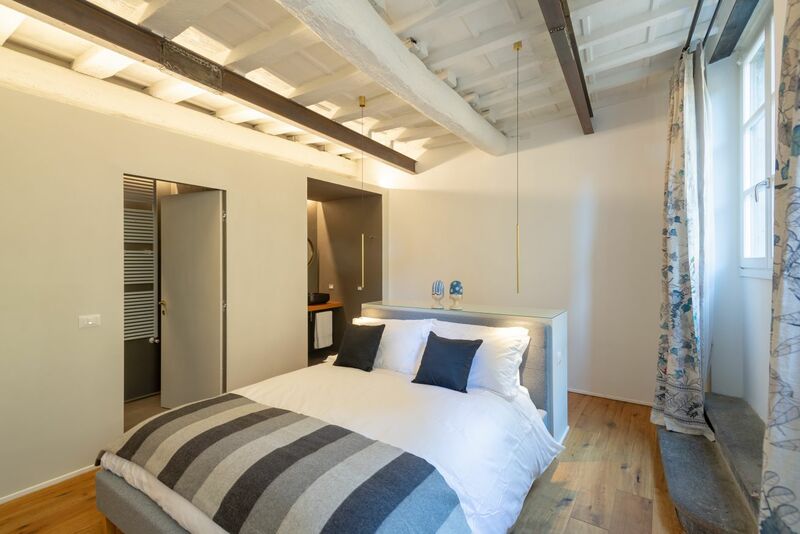 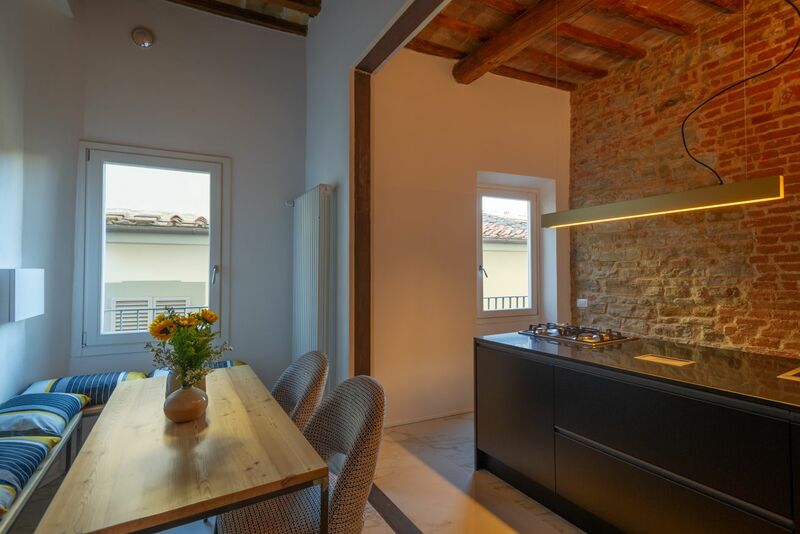 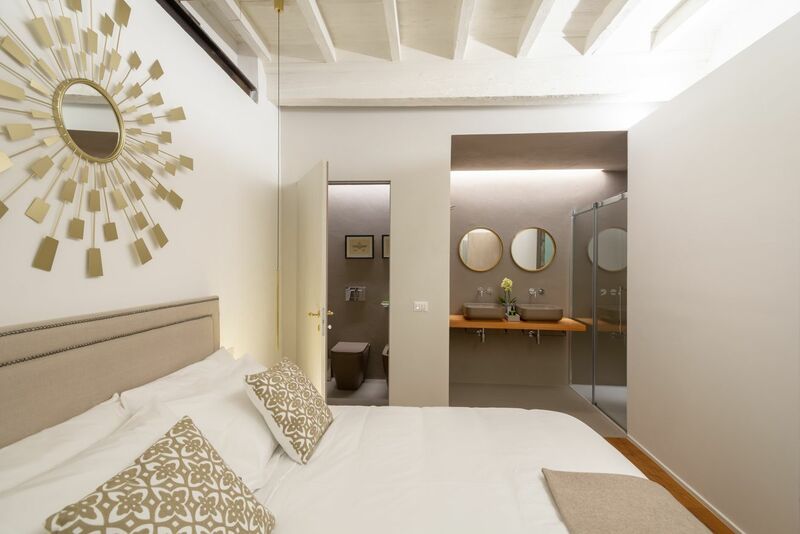 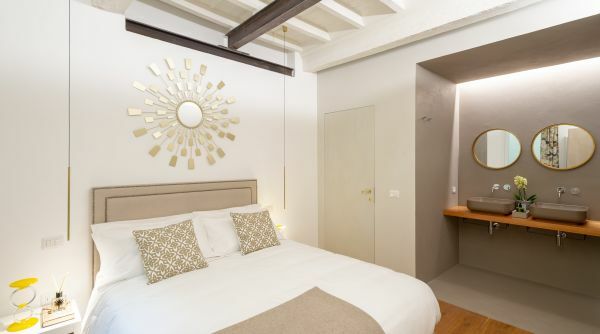 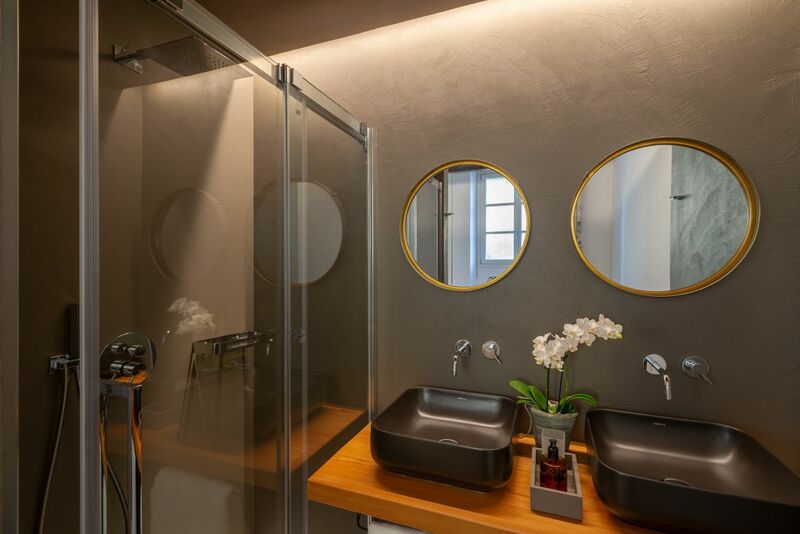 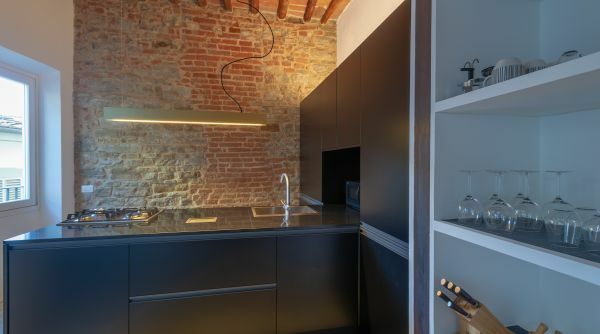 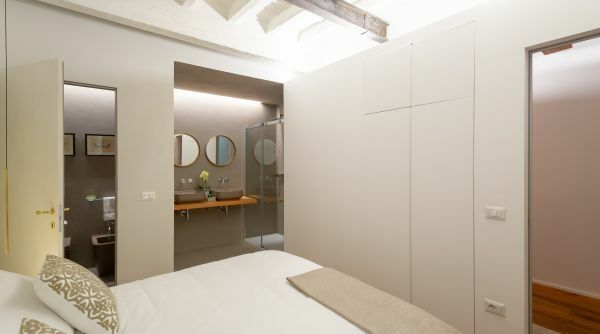 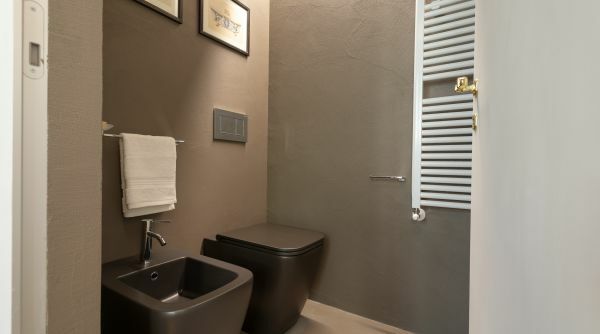 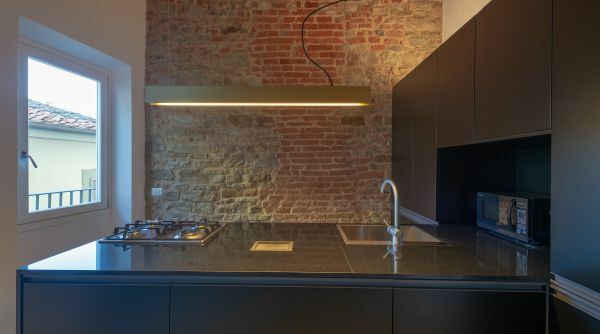 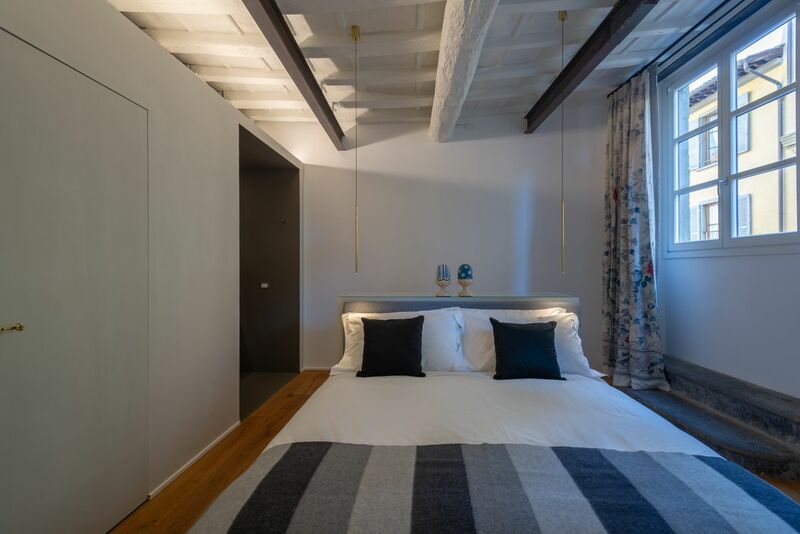 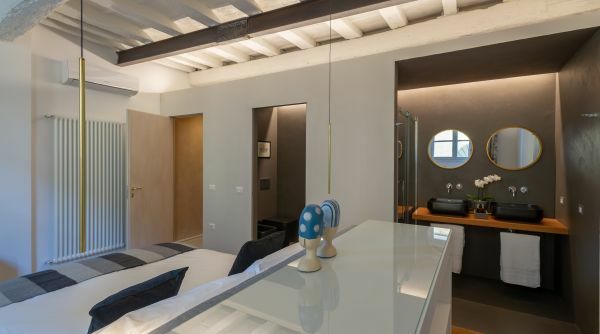 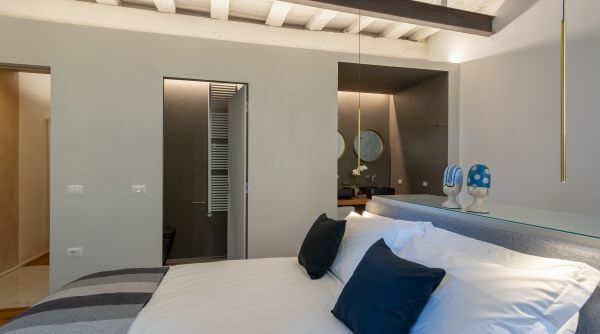 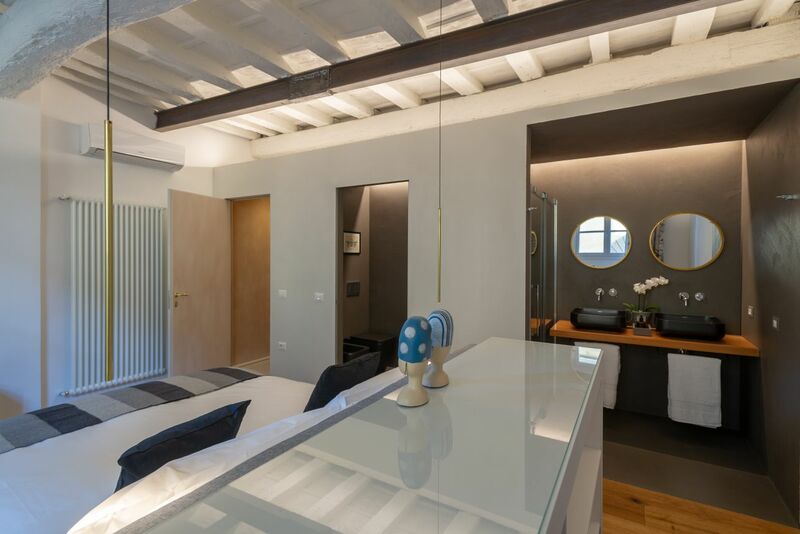 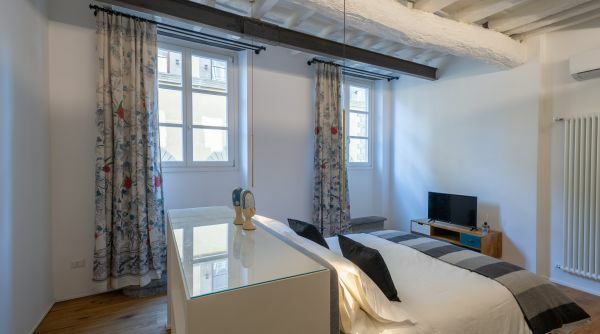 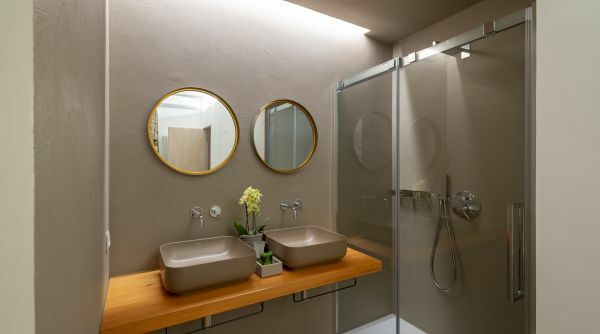 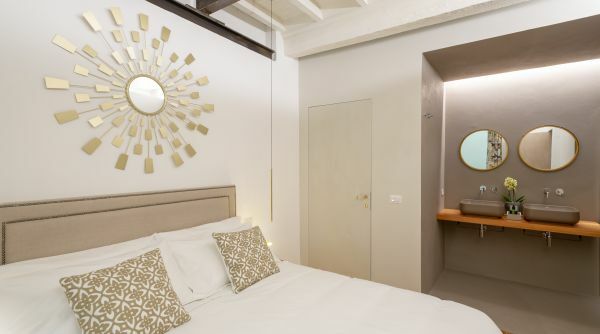 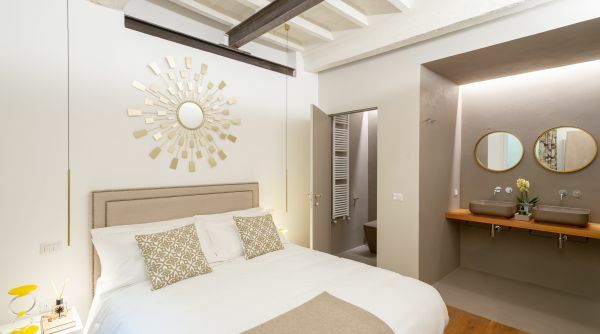 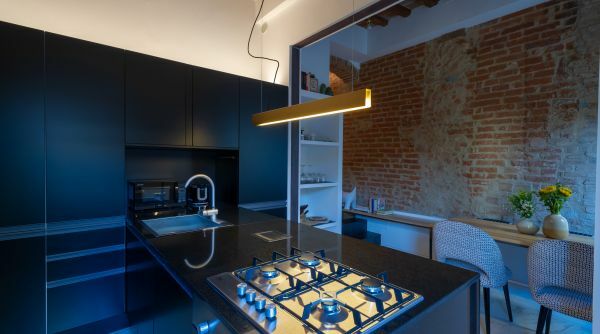 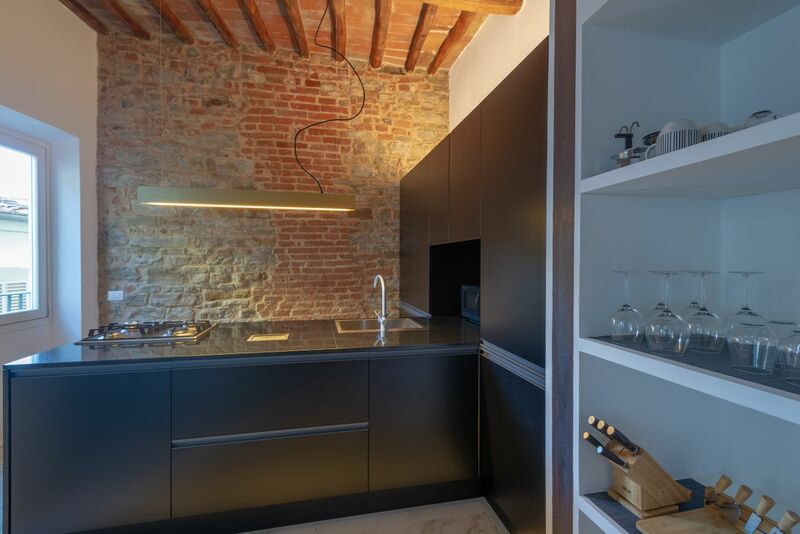 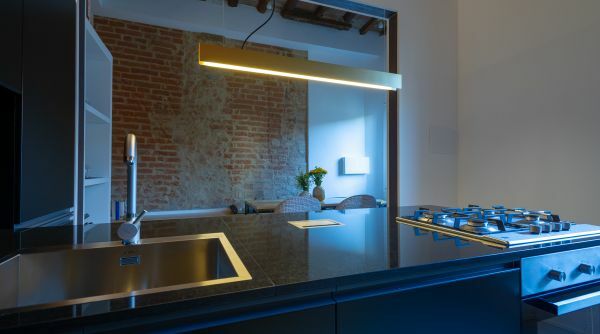 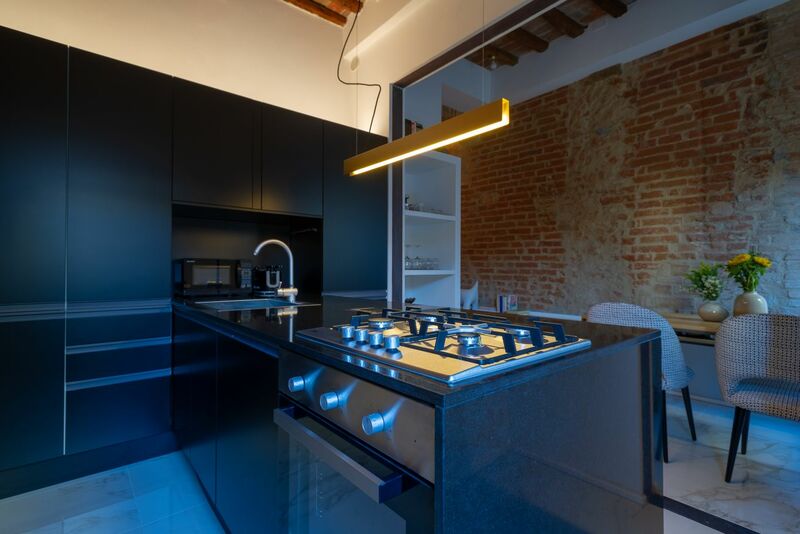 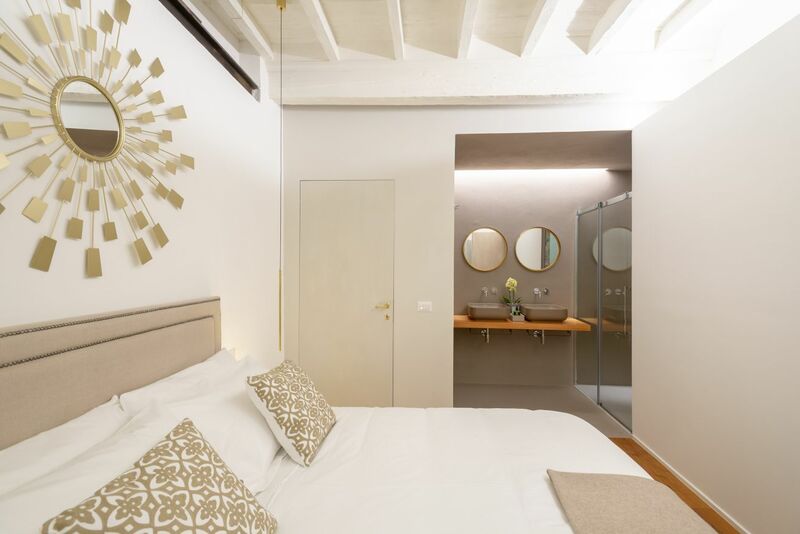 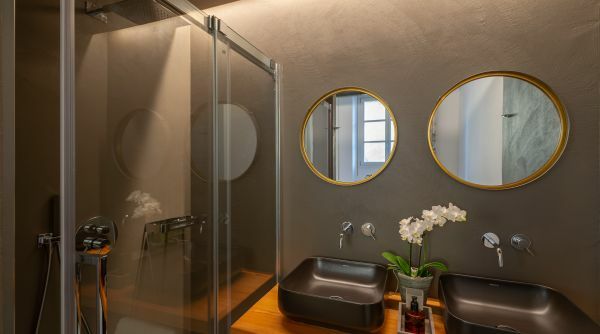 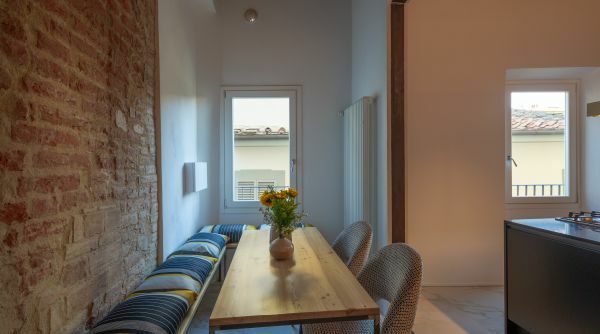 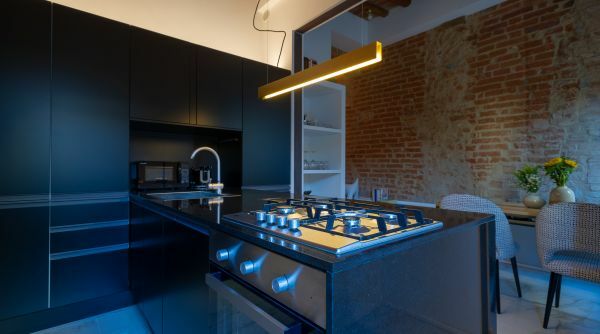 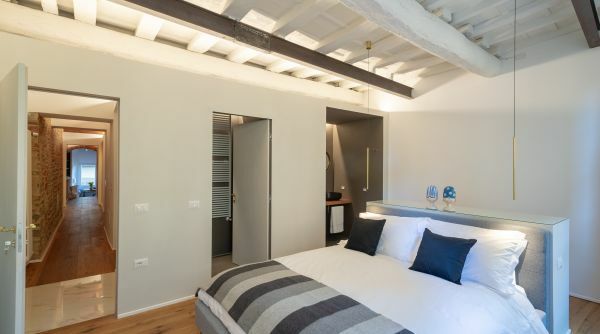 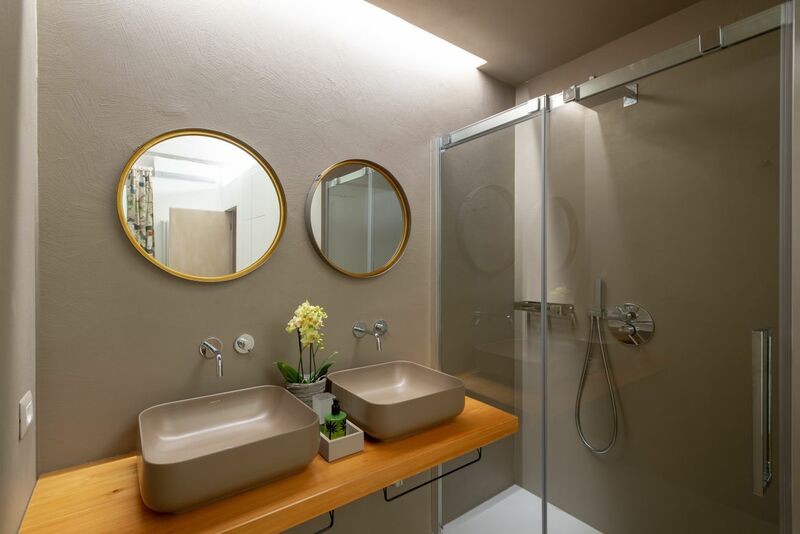 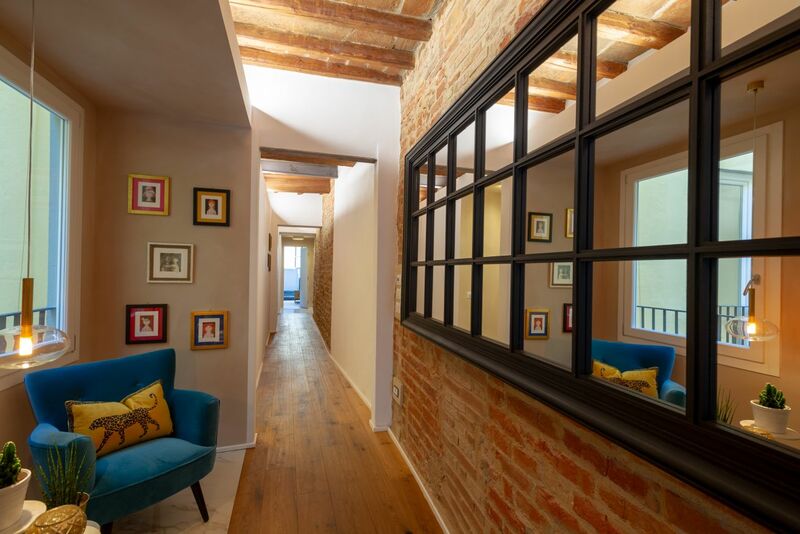 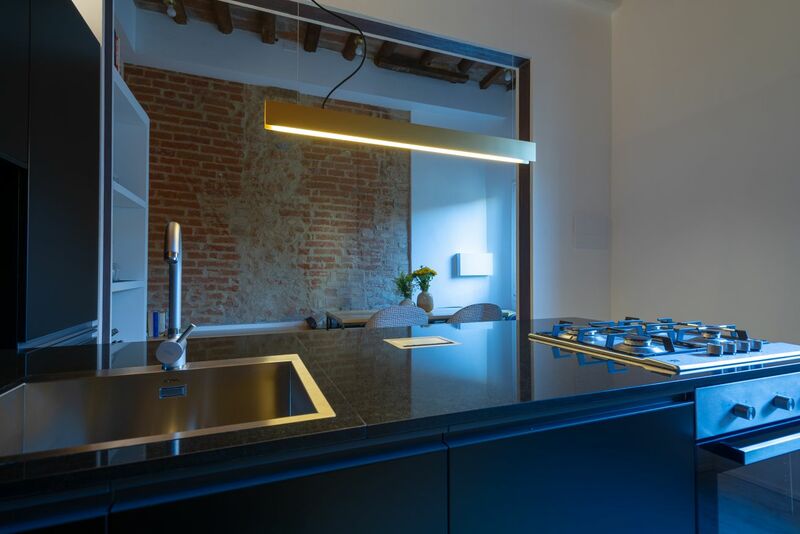 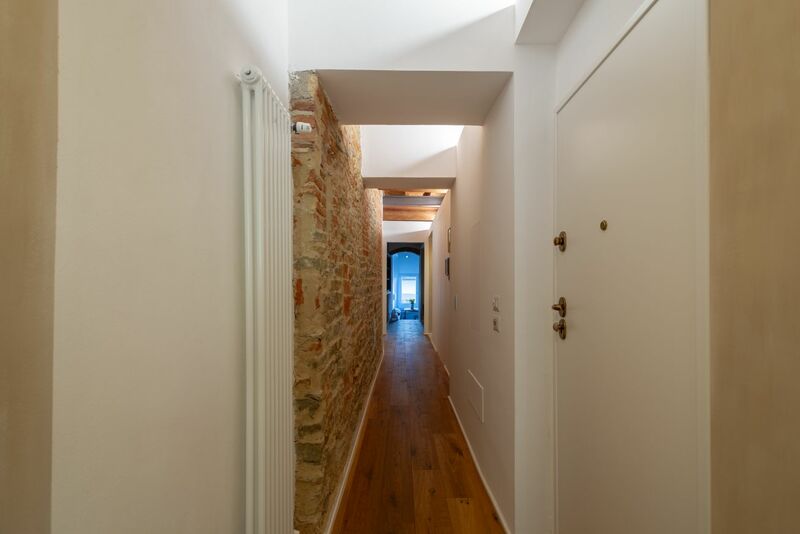 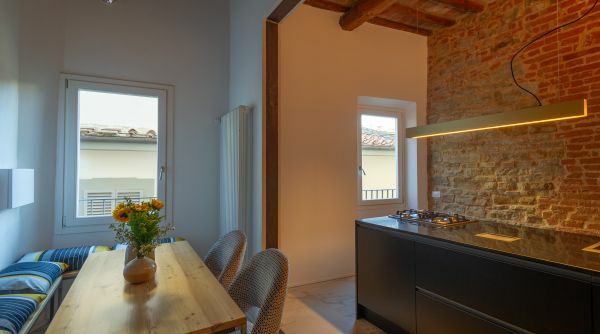 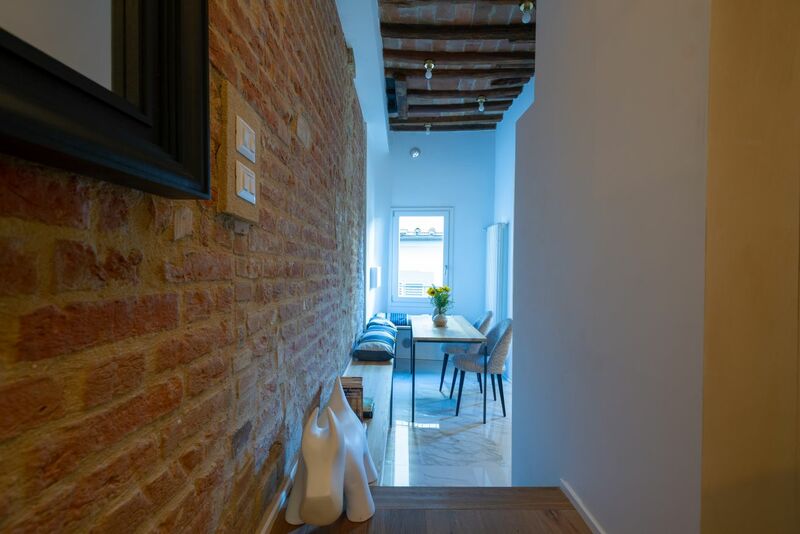 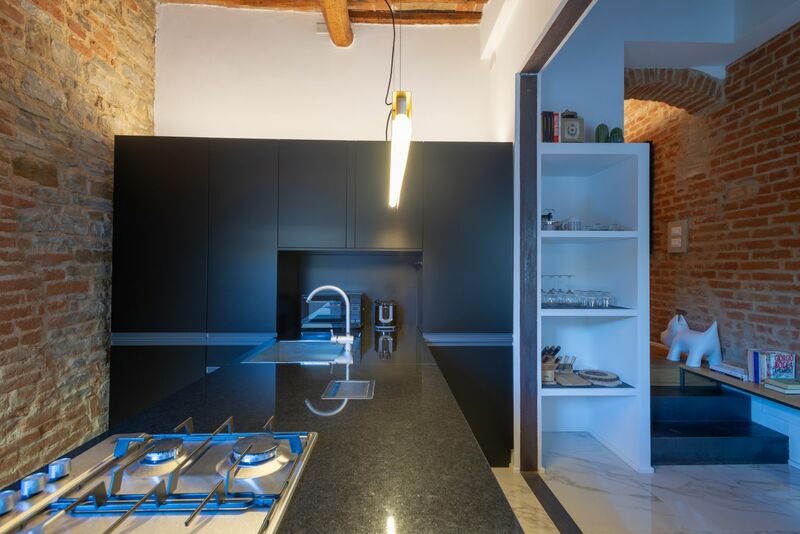 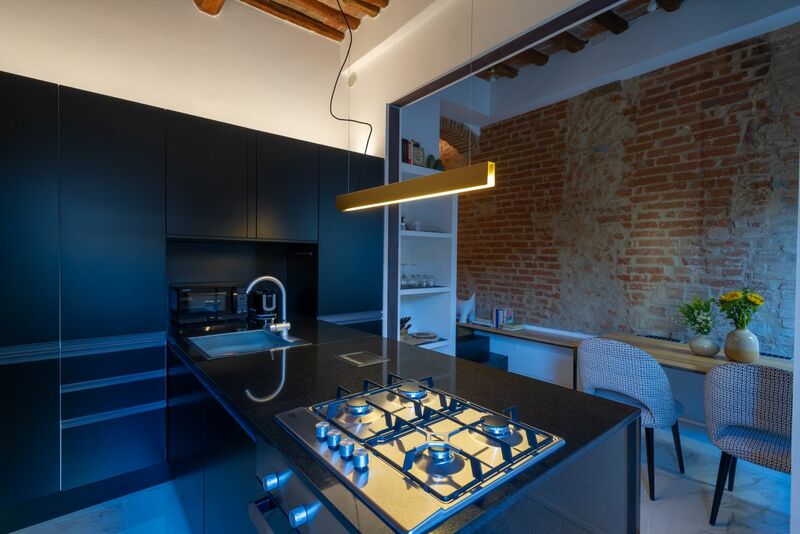 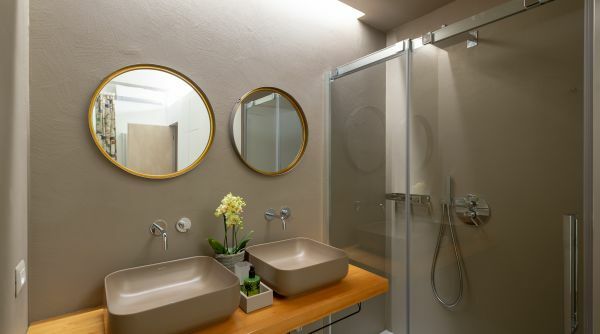 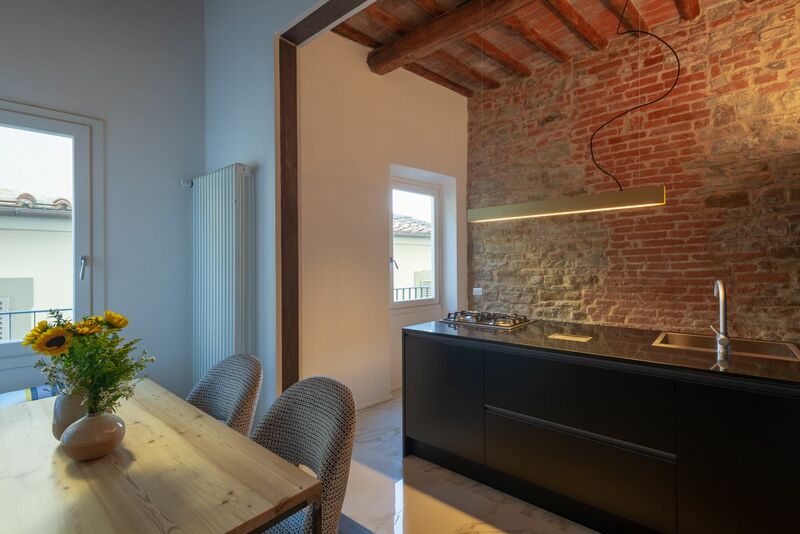 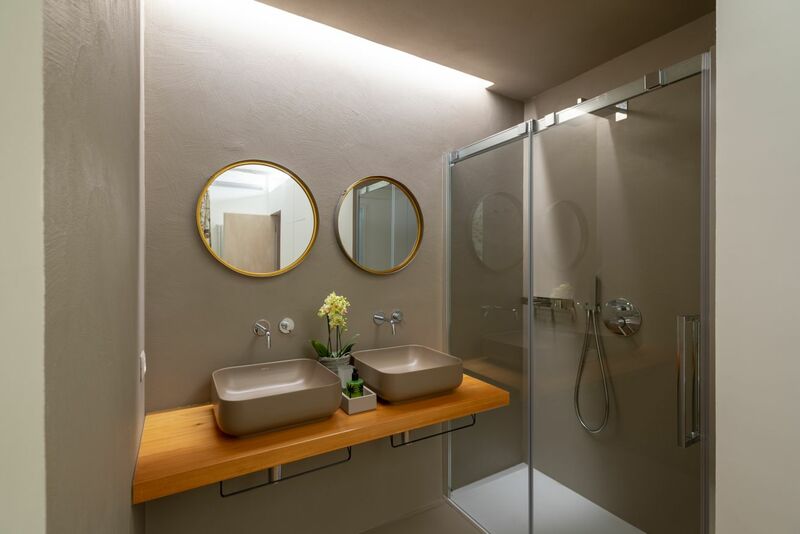 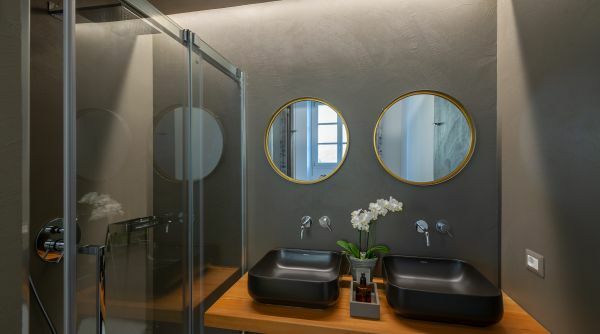 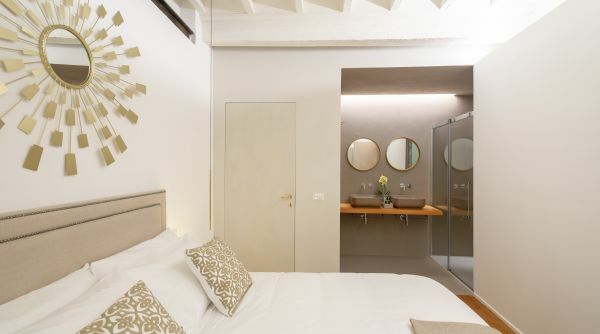 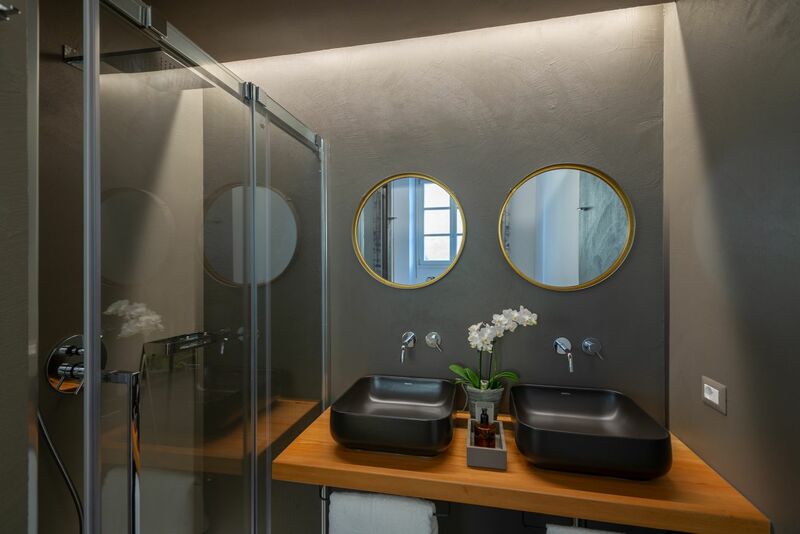 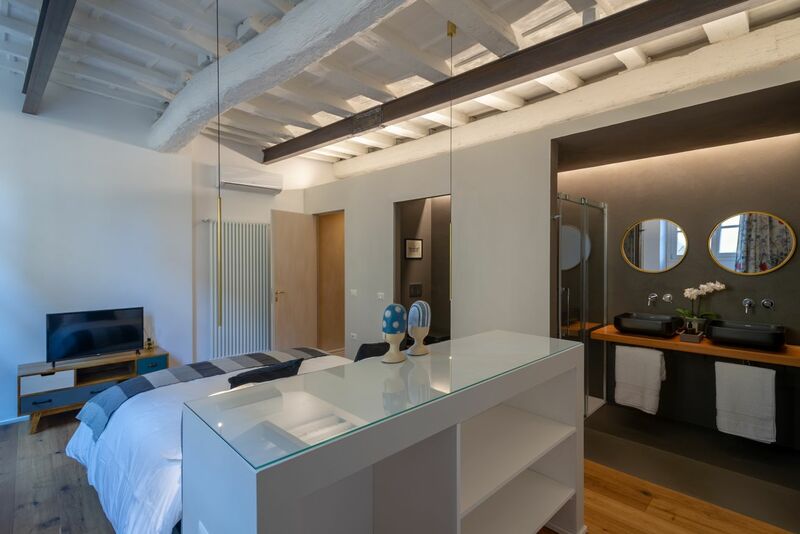 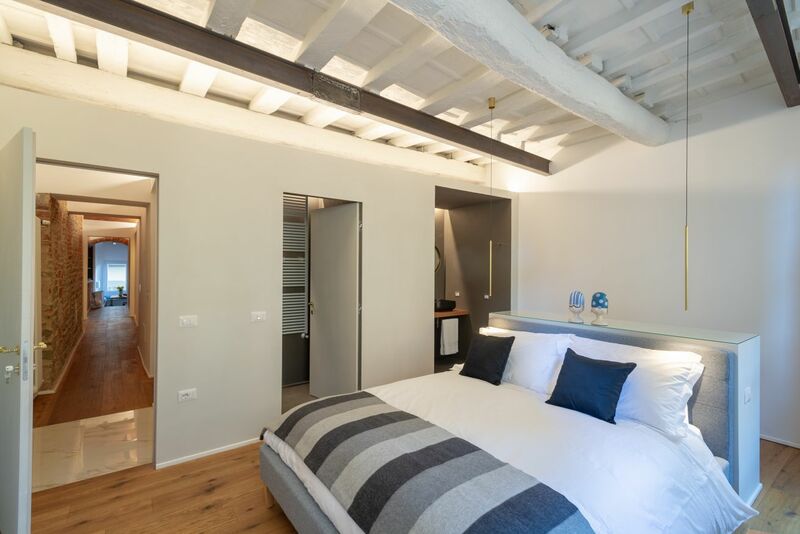 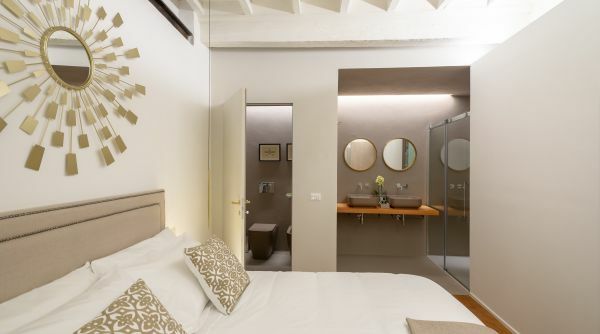 Modern and recently renovated apartment in heart of Santo Spirito area. 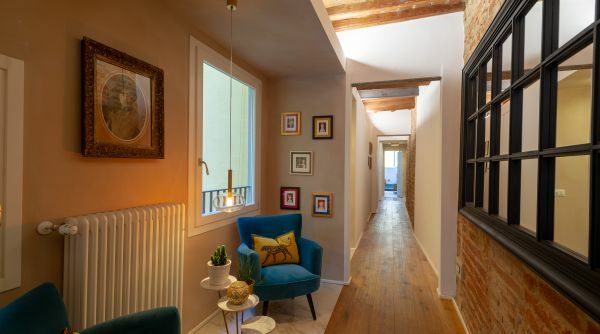 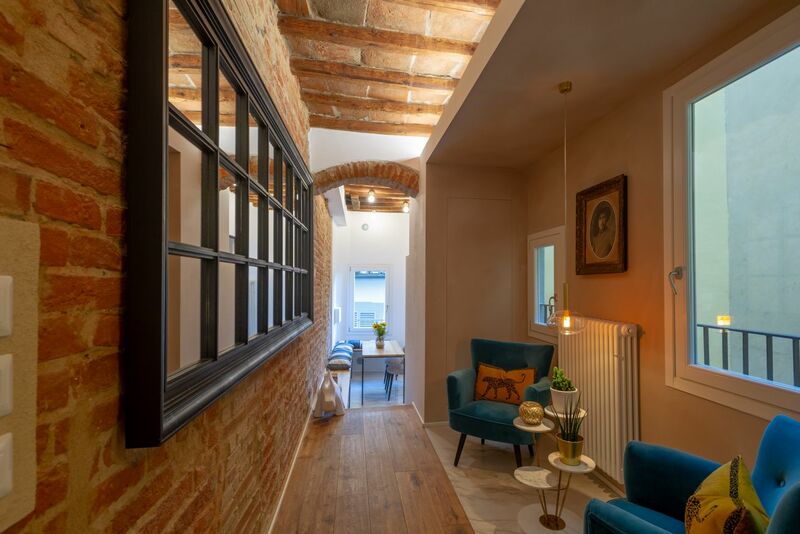 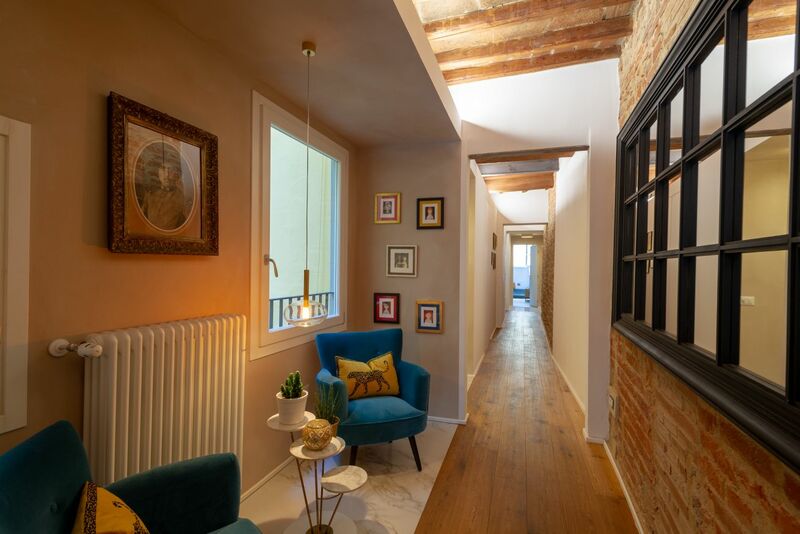 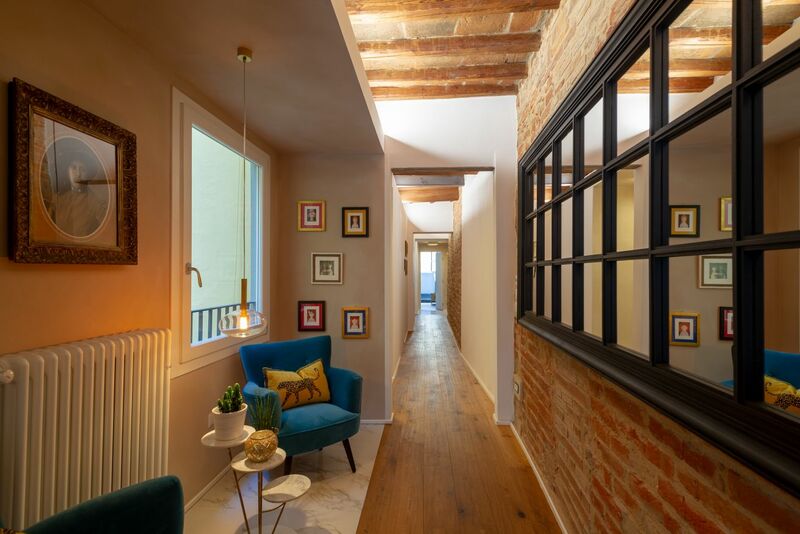 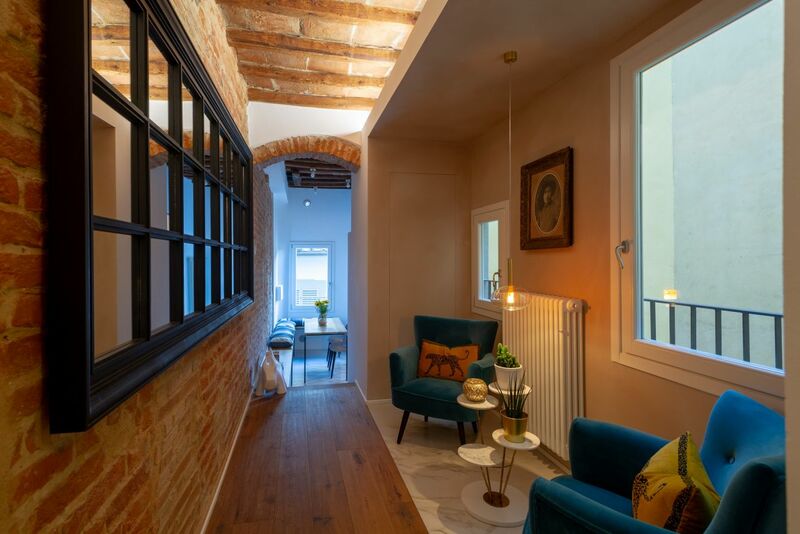 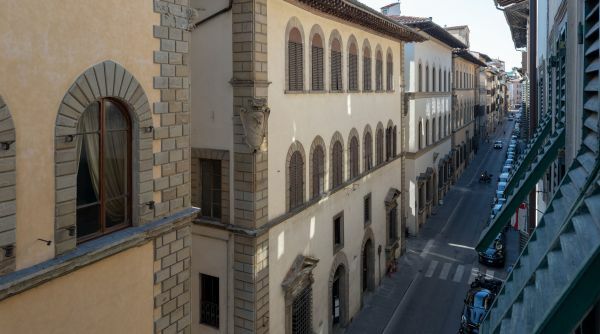 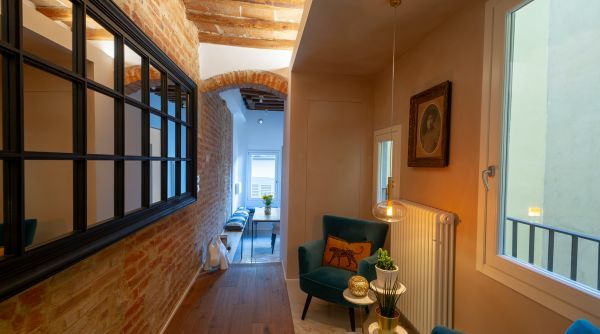 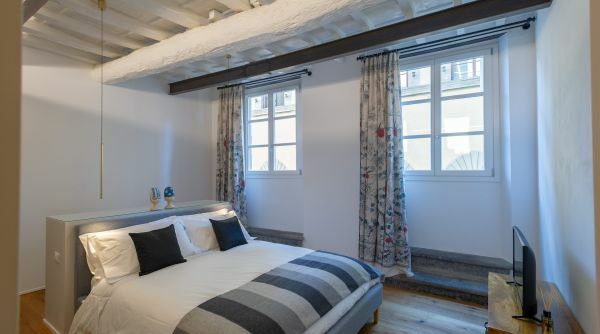 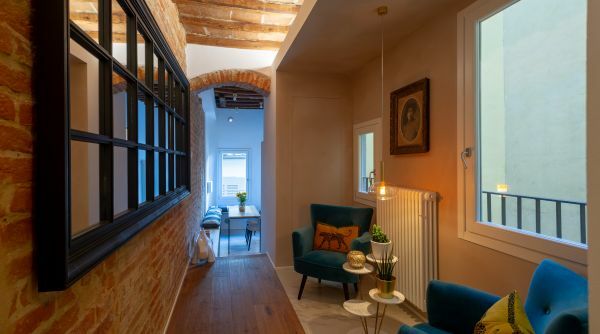 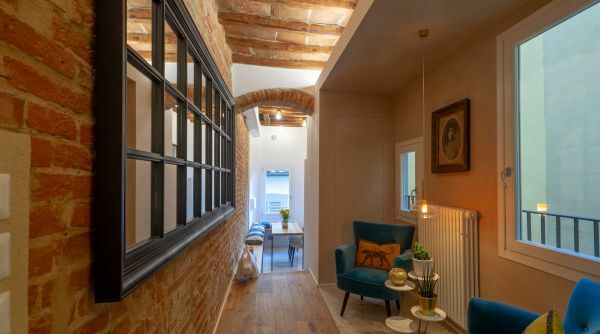 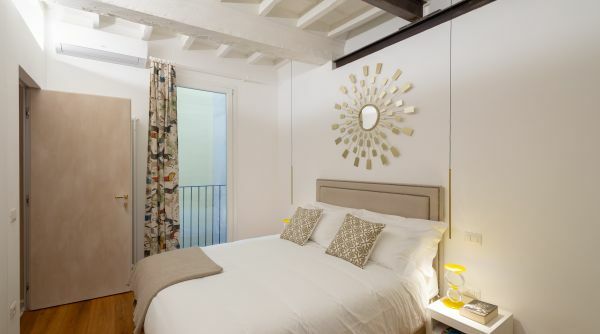 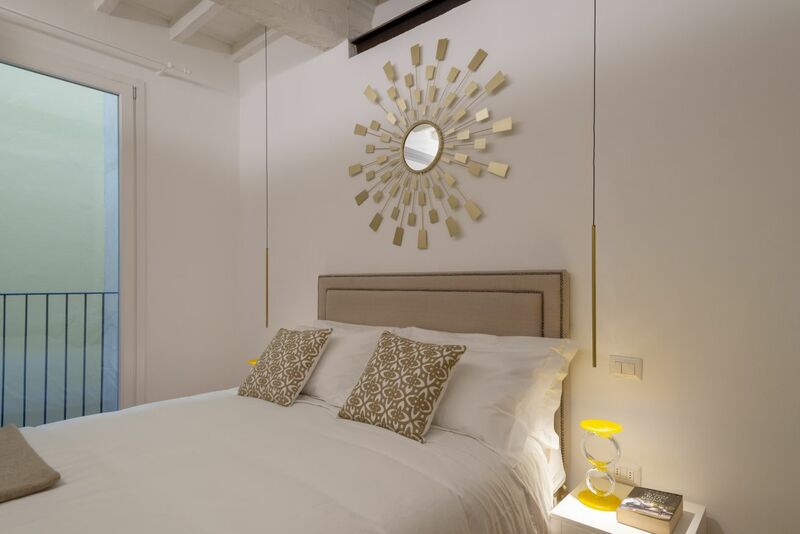 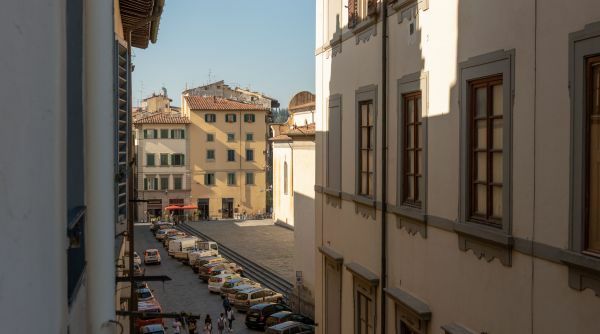 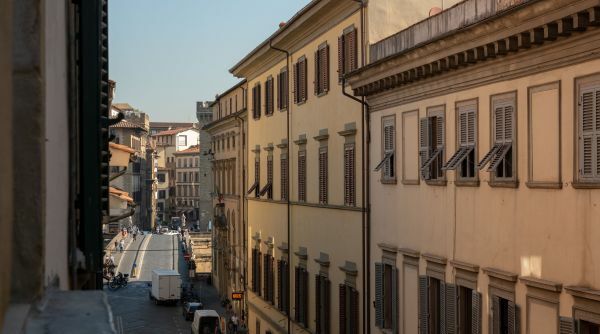 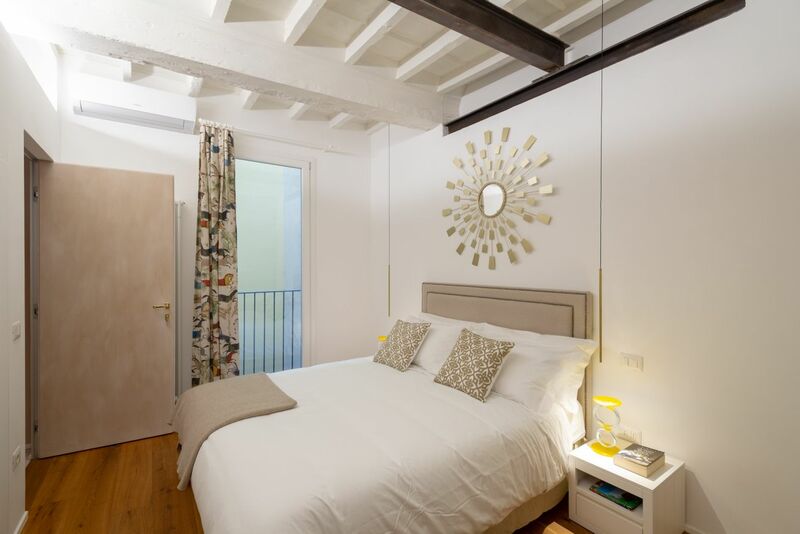 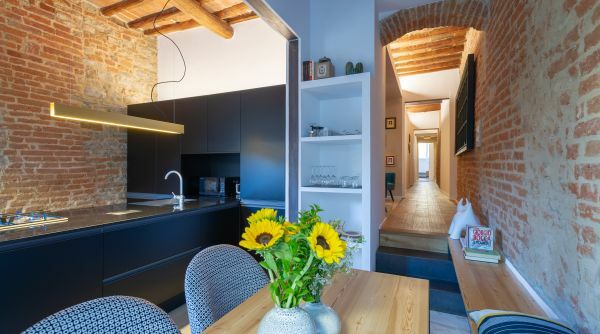 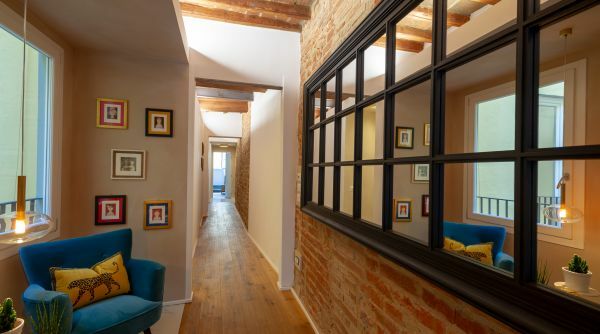 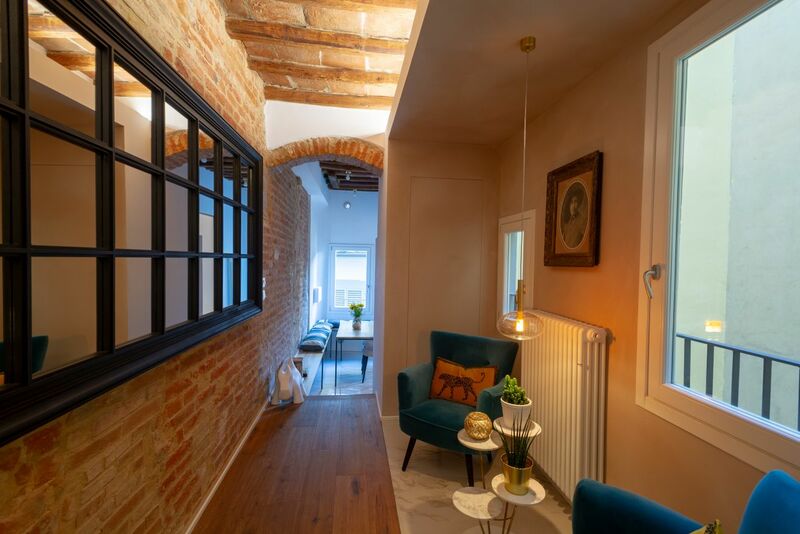 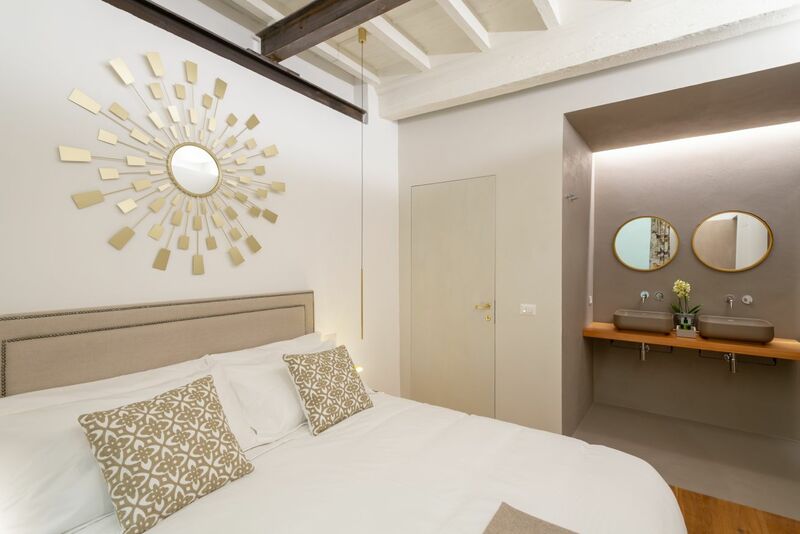 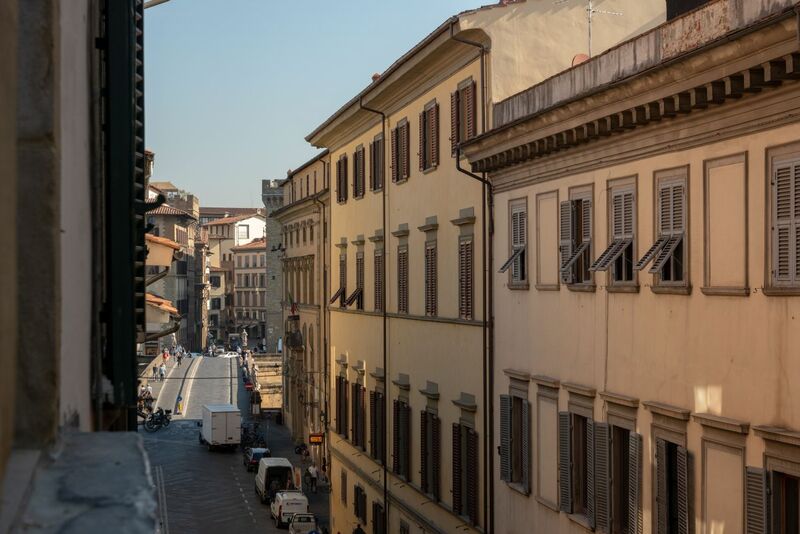 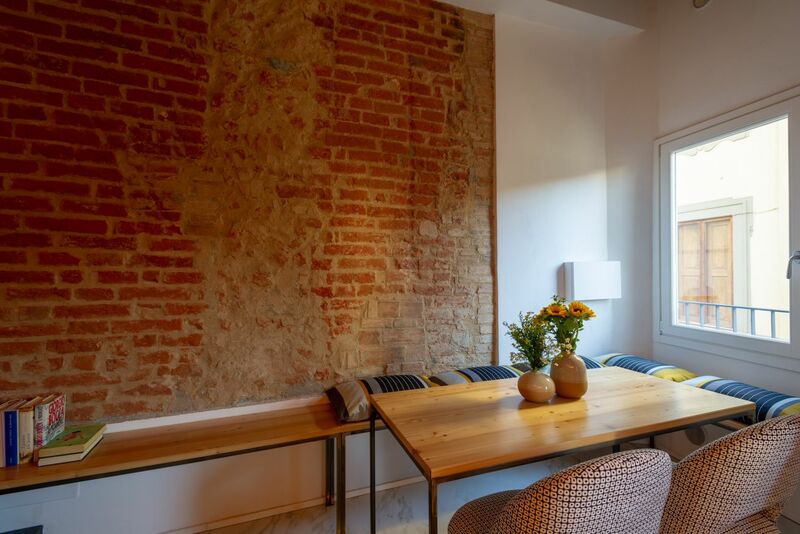 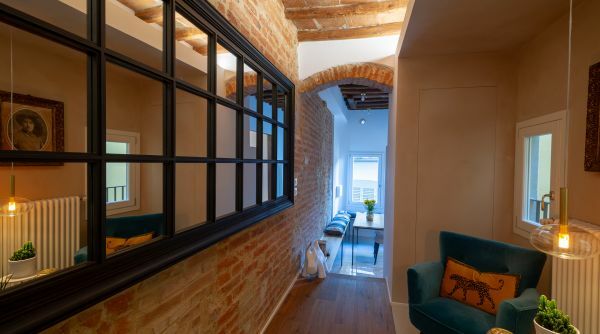 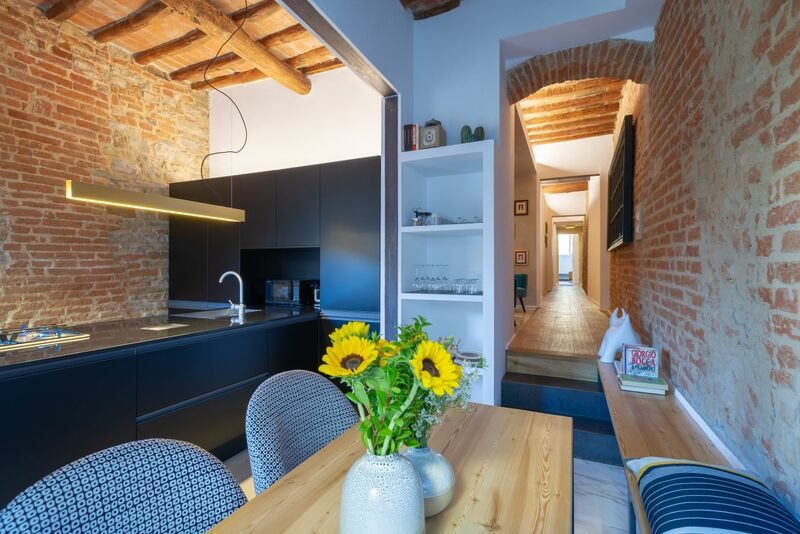 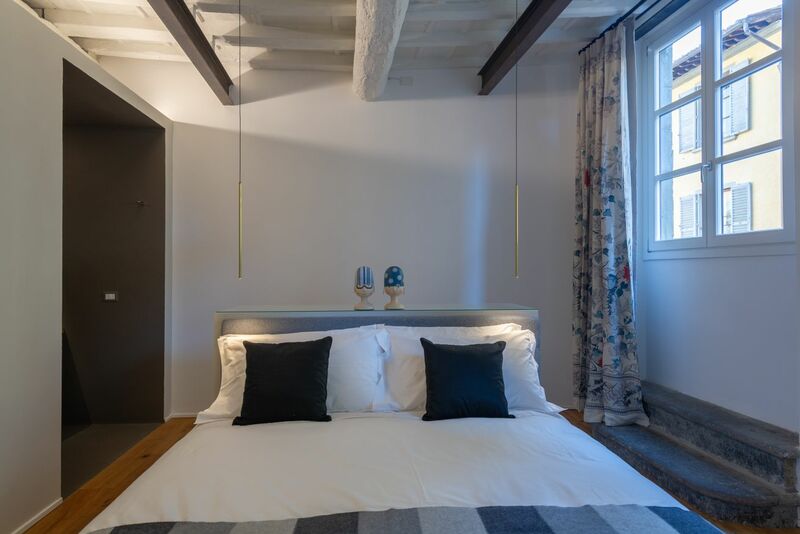 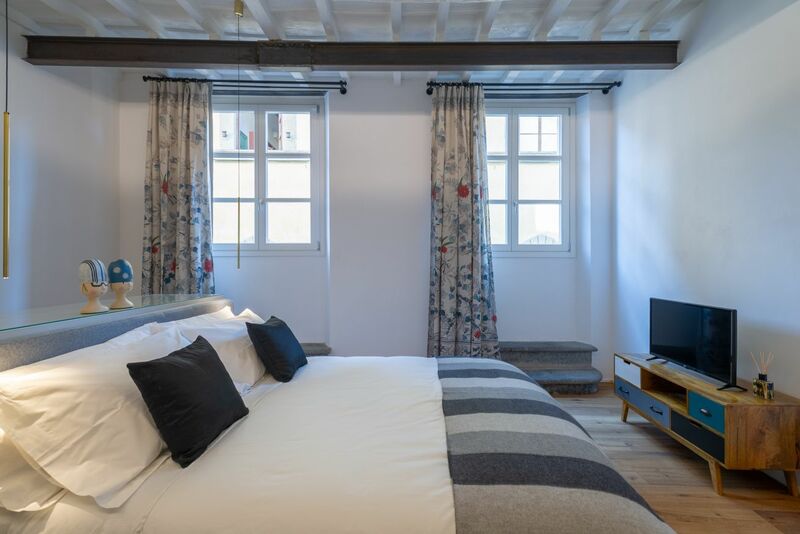 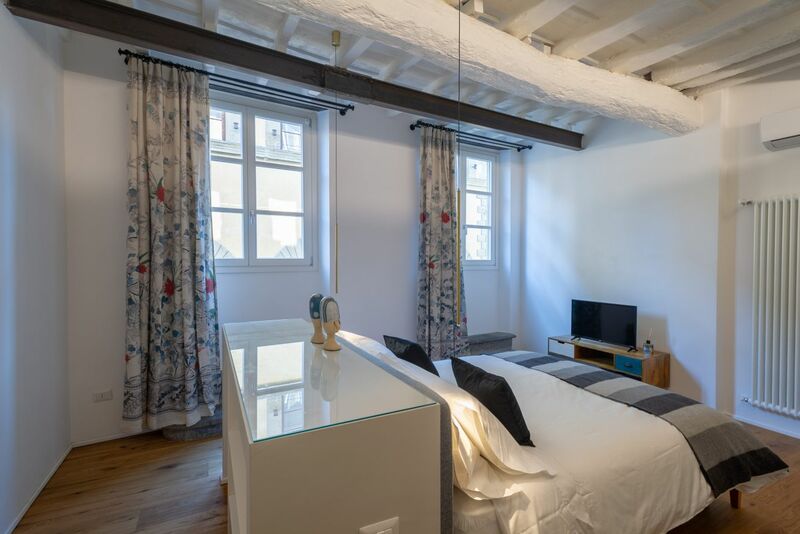 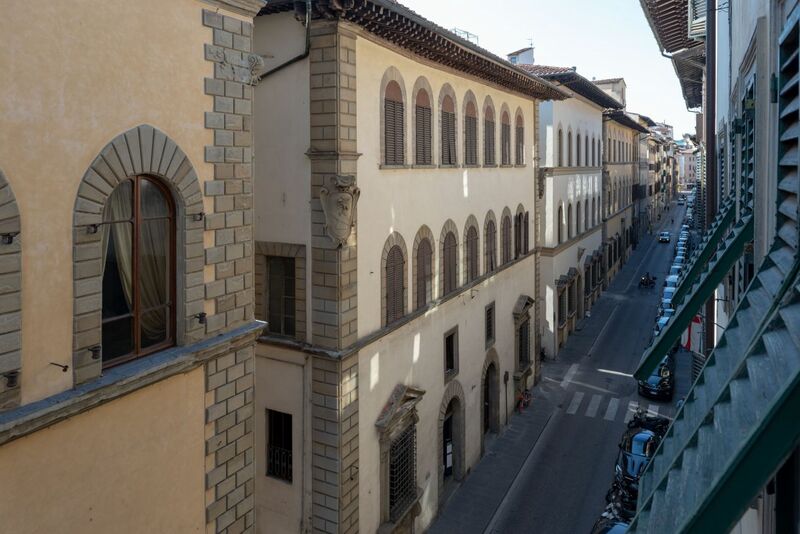 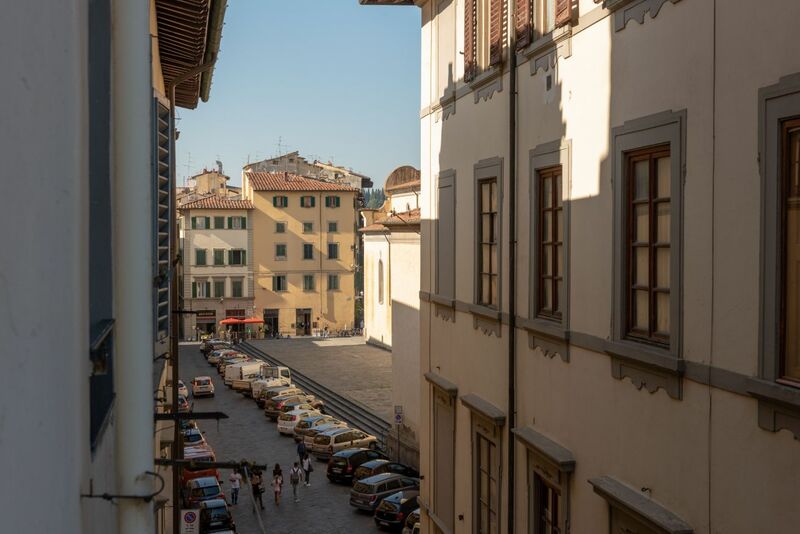 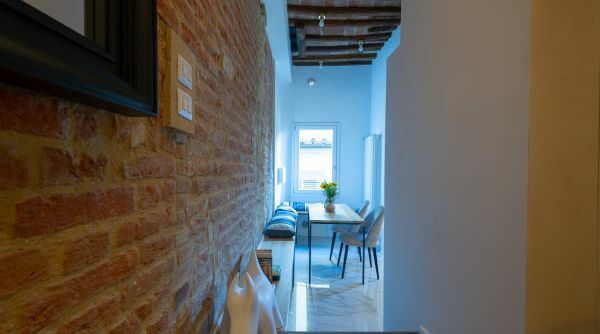 This apartment is located on the second floor with no elevator on Via Maggio surrounded by traditional antique shop as well as new and innovative shops and restaurants. 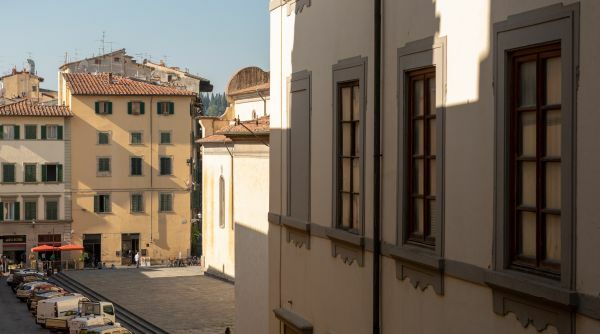 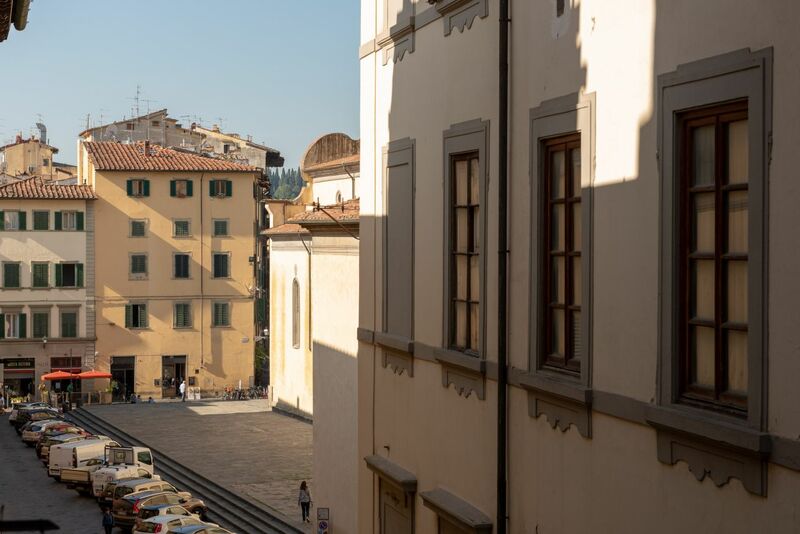 It is the ideal location to start discovering Florence. 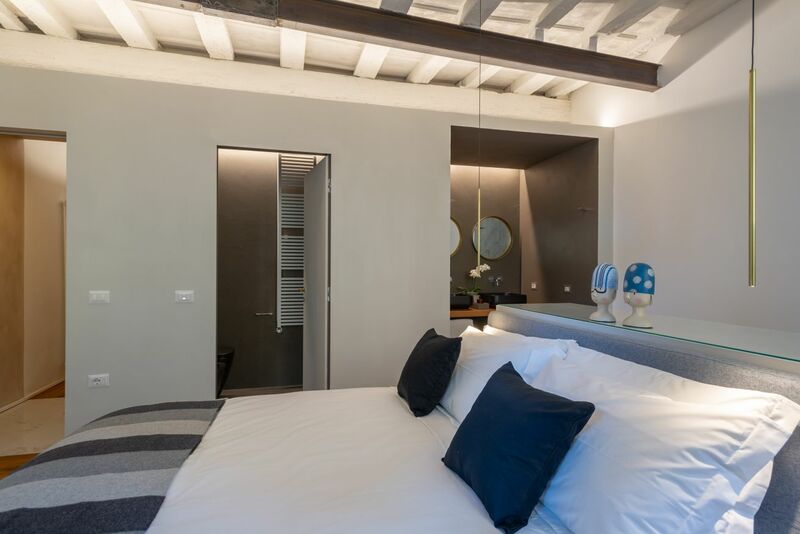 The property has just been entirely renovated in a modern and slick style that offers all the comforts of a brand new property. 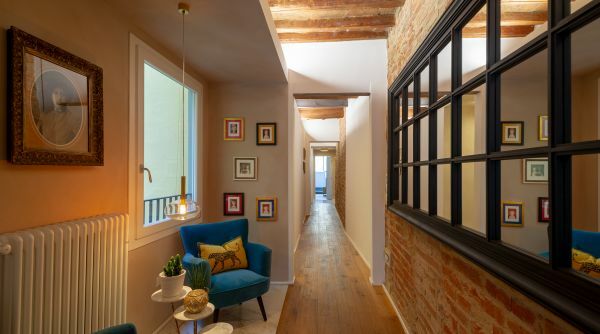 The entrance opens up to a corridor; to the left you will find the spacious master bedroom with a double bed at the center, a side table with a TV, and a space to hang your clothes. 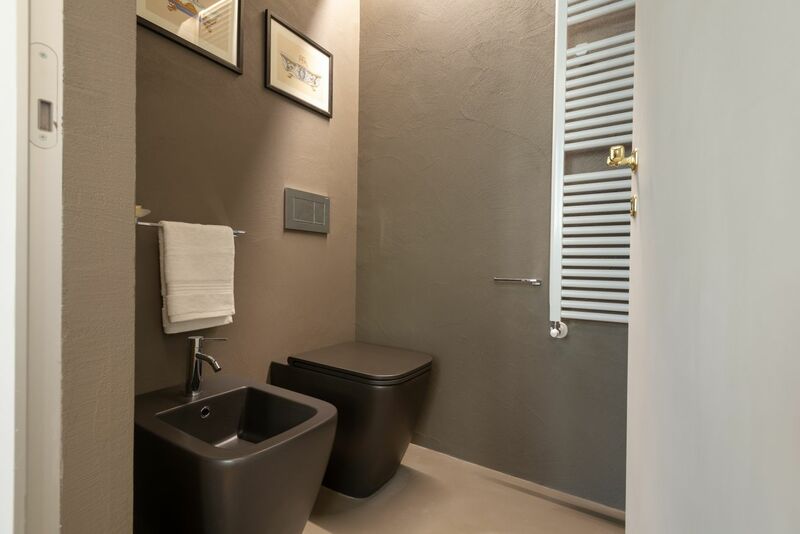 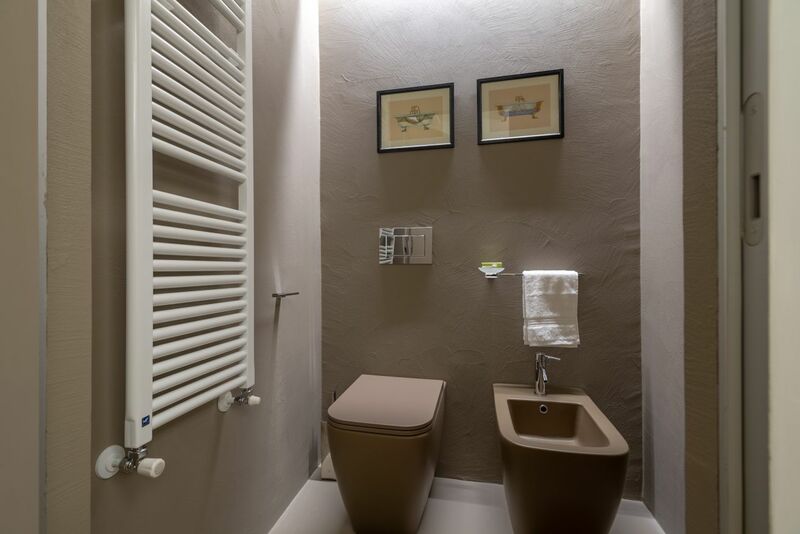 The shower and two sinks are inside the bedroom with the toilet and bidet behind closed doors. 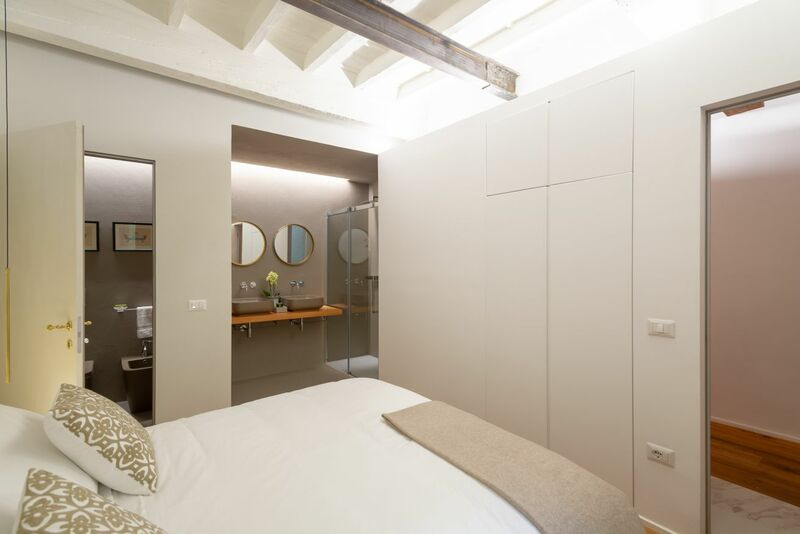 This bedroom has two big windows that face the main road giving the room natural light. 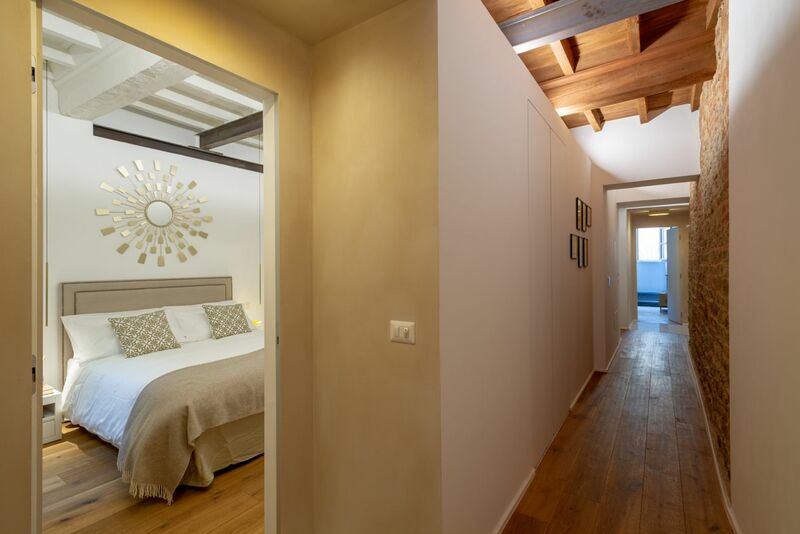 The master bedroom is fitted with an AC system. 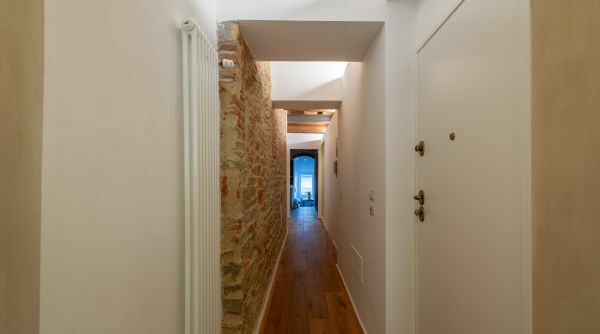 As you turn back to the hallway you’ll find the expose brick wall on the left and the cabinet with the washer / Dryer and other supplies you might need such as iron and iron board, among others. 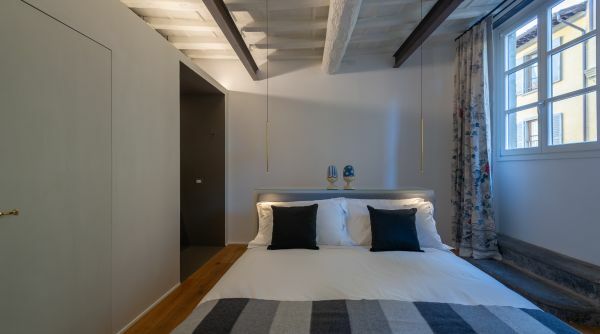 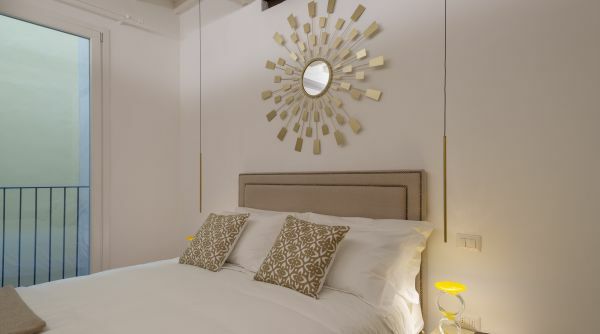 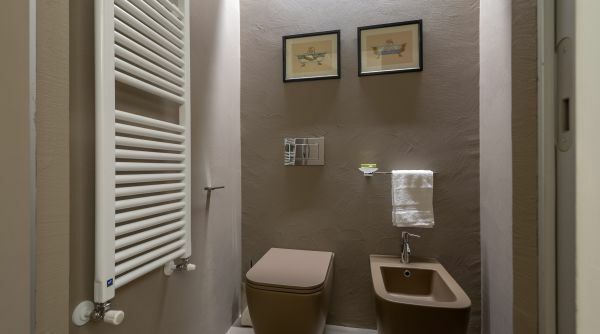 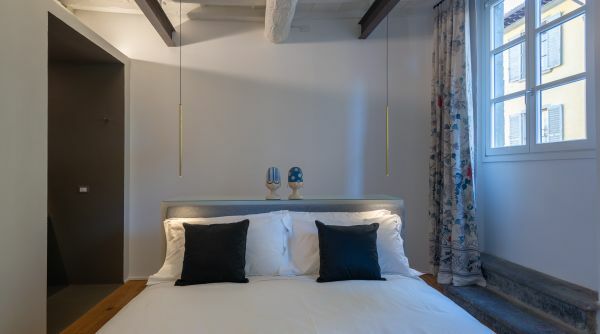 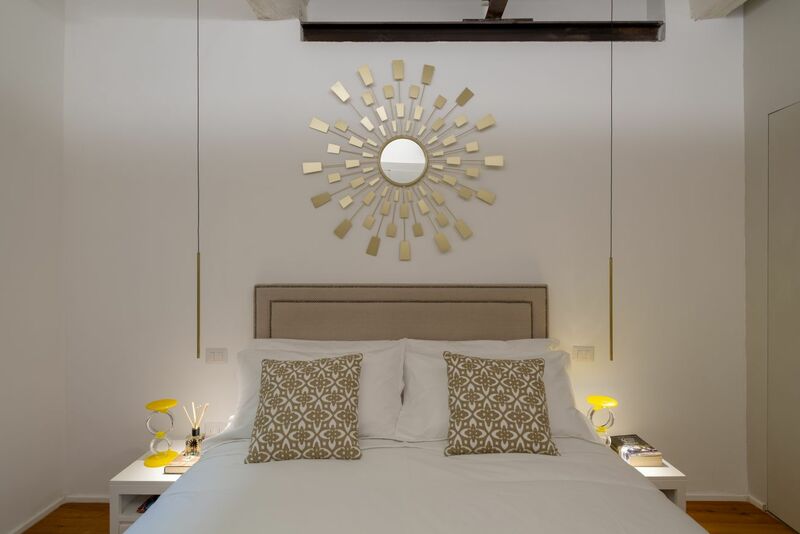 Next, there is the second bedroom, furnished with a double bed and built in spacious closet and an en suite bathroom with both sinks and shower exposed and the toilet and bidet behind closed doors. 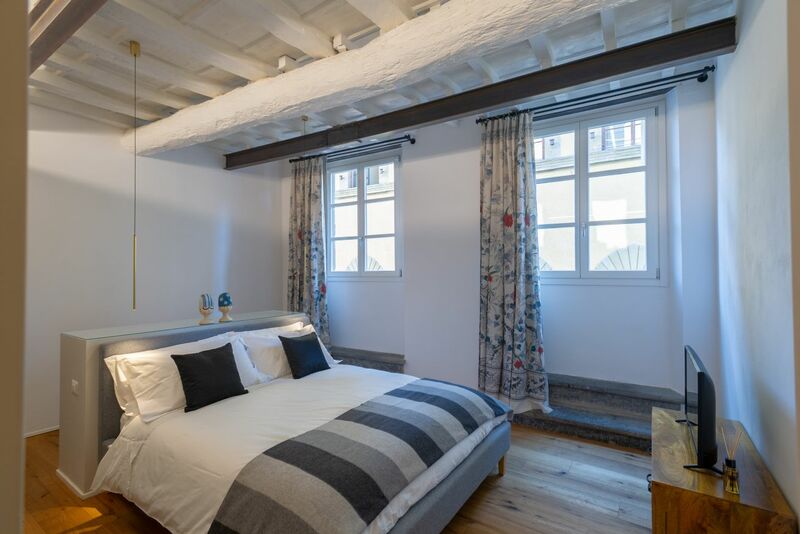 This bedrooms has a window that face the inside of the building making it very quiet and has an AC unit. 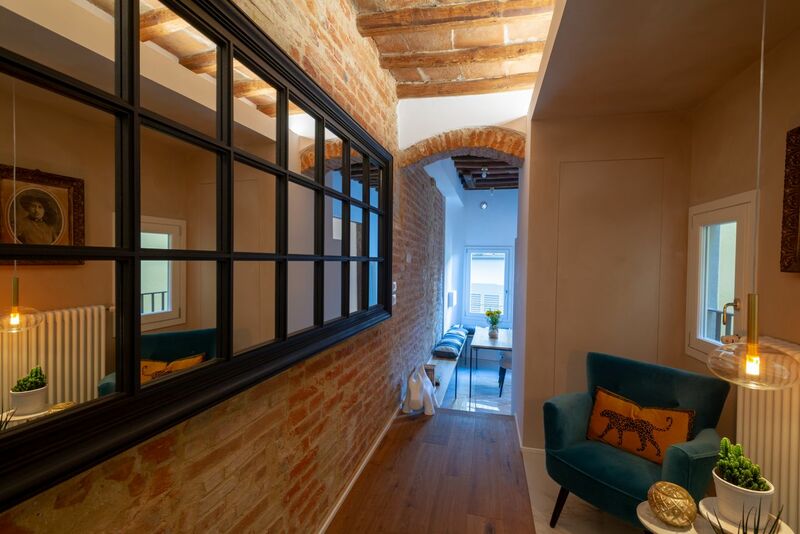 Walking along the corridor there is a sitting area comprised of two comfortable chairs and a coffee table. 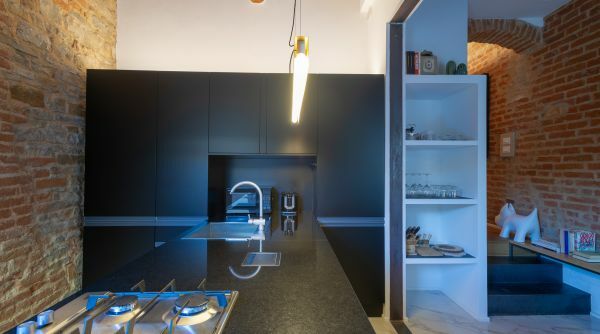 At the end of the hallway, the space opens up to the modern kitchen fully equipped for you to cook your favorite dishes. 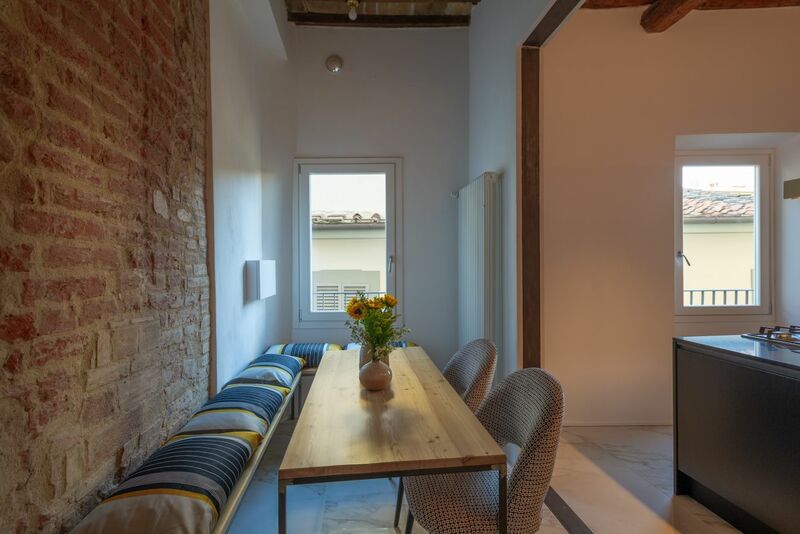 In the kitchen area there is also a table that sits comfortably 4 people. 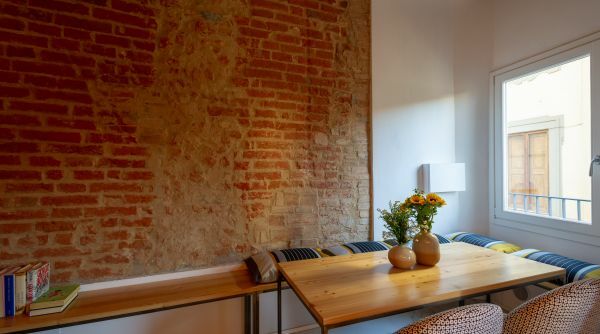 The entire property is very well lit and furnished, and has special décor touches such as exposed brick walls, wooden and marble floors. 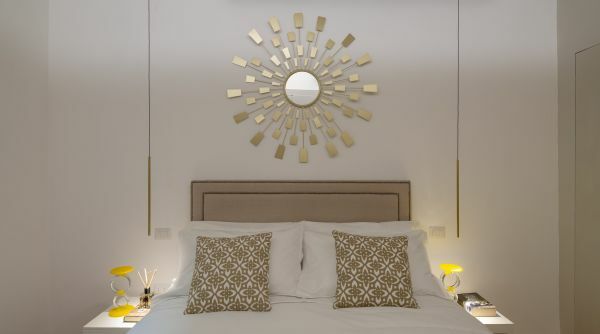 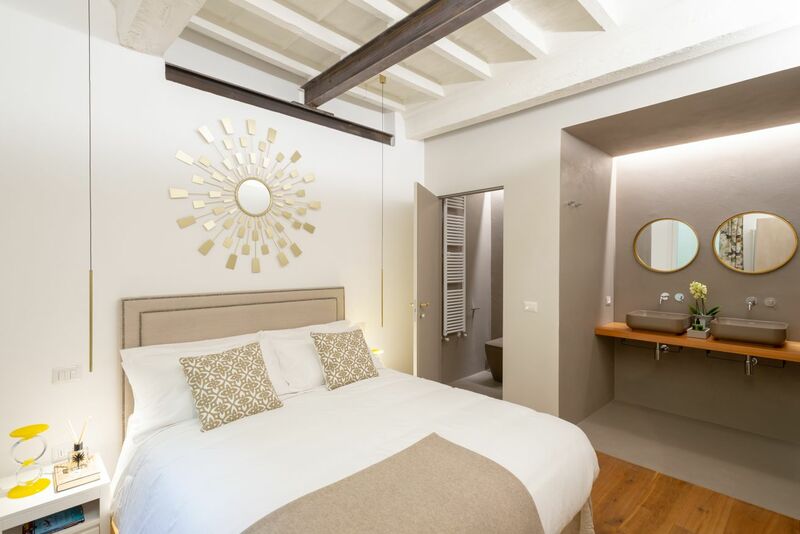 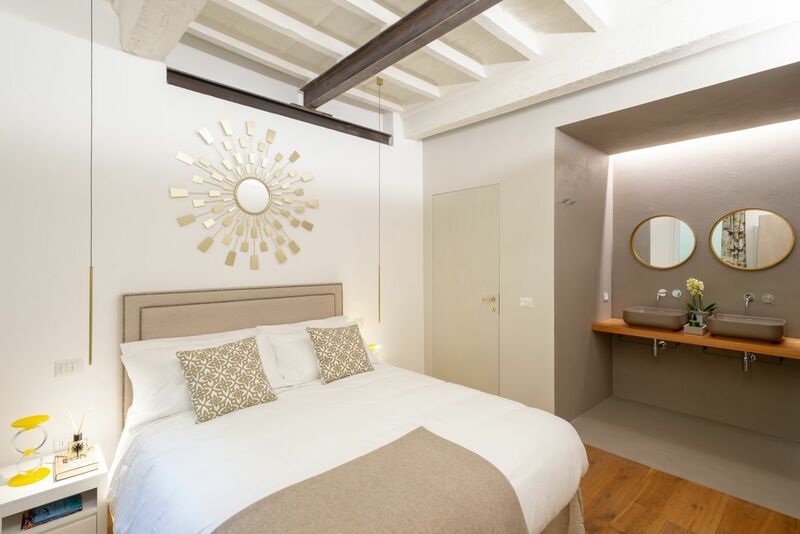 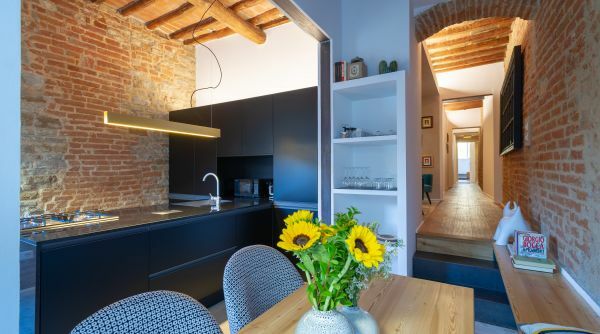 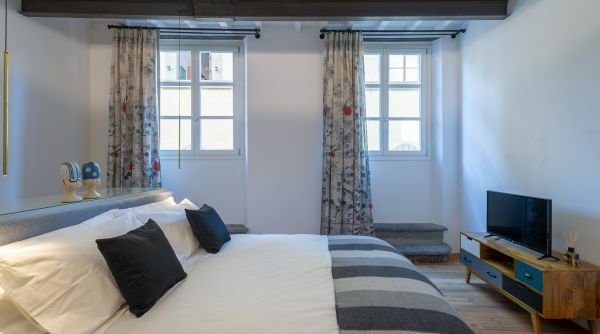 The location and design of this apartment makes it perfect for a group of travelers who are seeking style and comfort in the heart of Florence.